The latest in I.B. Tauris's series of scholarly studies of Who, Love and Monsters joins a somewhat crowded field. But it very much has something new to offer: not quite an out-and-out history of fandom, it nonetheless historically addresses “the evolution of fan discourse from the second half of the 1970s through to today” (p.2). The story it tells is one of how fandom triumphed, and how the trio of show, merchandise and fans – all rather distinct pre-1979 – had basically intersected by the 1990s, setting an agenda for the show's 2005 return. 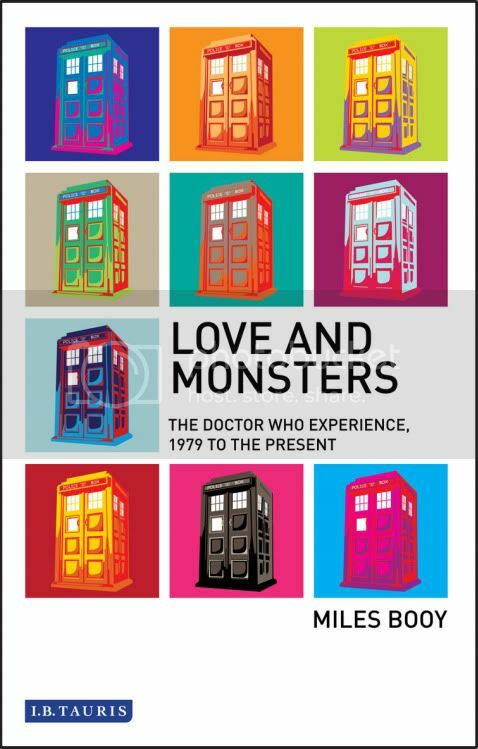 Author Miles Booy draws both on his own experiences within fandom, and on research into the show's interpretations in Doctor Who Weekly and elsewhere. But it's not especially clear where fan Booy ends and academic Booy takes over; the book occasionally seems to lack scholarly coordinates given that it reflects neither on its theoretical framework nor on its methodology. Of course, some may wish that more academic books would proceed without pesky theories and mind-numbing methods, but their absence makes it rather difficult to perceive just how Love and Monsters is engaged in any sort of dialogue with academia. (Instead one gets the impression that media studies scholars – my day job, for the record – are a strange breed of alien beings who write silly things about 'City of Death', fail to understand that fandoms have histories, and mistakenly think that US models of media fandom can account for Doctor Who's British following). And yet, of course, fans can be academics, just as they can be TV showrunners, or entertainment journalists, or comedians, or writers. Doctor Who fandom gets everywhere. By contrast – and it is a contrast, because Booy repeatedly pits fans against academics – it's very easy to see how this book engages with fandom. Essentially, it takes fandom's side against those daft media studies types, whilst at the same time aiming a few carefully targeted provocations at fan understandings of Who. For my money, this title would sit far more comfortably with a fan-targeted niche publisher rather than in an academic book series called 'Investigating Cult TV'. The fan part of me loved this book; the professional academic in me – though they are really one and the same – wondered whether it was monstrously lacking in scholarly debate and theory. But there's no doubting that Booy writes like a dream. Sometimes reading like Lawrence Miles minus the self-parodic vitriol, or an alt-universe Tat Wood, Booy is at his best when wrestling with forensically close readings of Who detail. His comparison of different editions of The Making of Doctor Who is rather wonderful, as is his analysis of the word “knickers” in the Target book range. Other treats include his re-reading of Malcolm Hulke's persona, and his celebration of Jeremy Bentham, not to mention analysing the impact of video releases, and the discovery of a whole new ”semiotic thickness” by fandom (p.116). Booy also productively champions Doctor Who's comic strips, and reads Grant Morrison's 'The World Shapers' as prefiguring The New Adventures and their concerns (p.120-1). Each chapter brings with it a wealth of Proustian madeleines, Doctor Who-style: Cosmic Masque, or Peter Haining, or the 1983 Winter Special. Mind you, there are also some curious omissions: Press Gang is analysed without any mention of Colonel X (p.144), and Booy's analysis of Timewyrm: Revelation is happy to tell us he's name-checked in its pages, but at the same time he offers no discussion of how his social position and affiliations within fandom may have coloured his accounts (p.149). Having been there might confer certain advantages, but a ground-level view can limit insight just as much as it can grant revelations. Love and Monsters is strongest on the unfolding texture of what it has meant to be a certain sort of Doctor Who fan, but weaker when it comes defining the bigger picture. For one thing, the book's parameters are hazily defended. Why should 1979 be the starting point? (It isn't, in any case; The Making of Doctor Who is analysed as a pre-79 turning point). But if Booy wants to illuminate the “merchandised reading” of Doctor Who, then why not study 1960's Dalekmania? Why not study the World Annuals that generations of fans grew up with in the pre-Weekly world? No entirely convincing rationale for these absences is forthcoming. And for that matter, why is online fandom not really represented? Because Outpost Gallifrey was deleted, and so historical records can't be pored over? Perhaps, but Booy's not-a-history still seems somewhat arbitrary both in its start and end points. Indeed, its author apparently takes a negative view of online fandom – or may be it's a nostalgic lament for the days of paper 'zines – asking: “what will it mean to be a fan when fan status can be... acquired simply by logging on and marking the new episode out of ten?” (p.190). Such a question seems faintly dismissive, as well as assuming that fandom can be acquired in this manner alone. As such, this book brings sharply into focus the need for more work – on pre-1979 fan discourses (recently documented elsewhere by Keith Miller), and on Internet fandom. To my mind, Booy also downplays changes in the TV industry; although the showrunner model of TV production is considered in relation to BBC Wales' Doctor Who (p.189), it could be argued that fandom's eventual triumph depends, in significant ways, upon shifts in how television production has been professionally conceptualised. Studying fan discourse without also studying production discourse means that Booy's story is necessarily partial, and treats only one part of what is likely to be a more complex tale. But rather than criticising it for what it isn't, Booy's book should be celebrated for what it is: an academic study created out of the skills of close reading that were evidently nurtured by and within Doctor Who fandom. Had I not religiously read Celestial Toyroom as a teenager, or Doctor Who Weekly as a child, I very much doubt I would have become a media studies lecturer in later life. And therein lies another possible history of fandom, one shared by Booy and myself and countless other folk: not the story of fandom in and for itself, but rather as an inspiration – an opening – to other lives, and creations, and professions.